CAMP SCHWAB, Okinawa, Japan — Camp Schwab held its 22nd Annual Christmas Party with Okinawan children Dec. 6 at the United Service Organizations' building. The event was aimed at promoting camaraderie as well as lifting the young Marines' spirits during the holiday season, many of whom will be missing their family Christmas back home. According to Fumio Iha, liaison/community relations specialist, Headquarters and Services, Camp Schwab, this event began 22 years ago after the Marines of Camp Schwab were invited to many events in the Henoko District of Nago City. The Marines decided to reciprocate the goodwill by inviting the children to spend part of the holiday season on base with the Marines. The Marines of Camp Schwab have been inviting the future leaders of Henoko District to the Christmas event ever since. "This event differs from how Christmas is celebrated off base," explained Iha. "The Japanese celebrate Christmas by having small parties, and Santa comes here in on a big fire truck. It's a unique experience for the children." Even with less than perfect weather, the Marine and Okinawan turnout was about what the event coordinators expected. 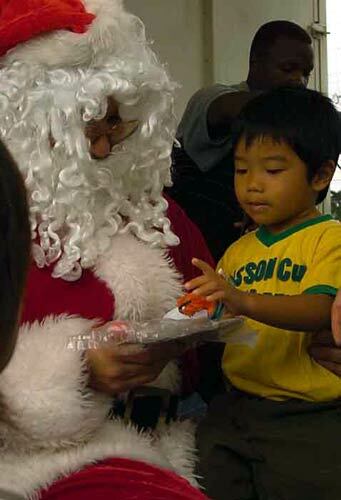 There were approximately 140 Okinawan children and about 60 Marines from Camp Schwab at the Christmas party this year. "It's rare that we get a chance to get together and have a good time without the language barrier interfering with it," said Iha. "Everybody seemed to be happy even though they were soaking wet." The USO and Camp Services aboard Camp Schwab coordinated the party. There was a cookout provided by the USO as well as the soba soup which was brought by representatives of the Henoko District. Although there was a slight language barrier, it didn't play any real role in the enjoyment of the event. The Marines interacted with the children as if they had known them for years. There were Marines who were holding their new little friends in their arms, proving that the Marines on Okinawa and the Okinawan locals can live together and treat each other as family. "We hope this reminds the young Marines of their little brothers and sisters back home," said Yasumasa Oshiro, district mayor of Henoko. "I just heard about this earlier this morning when my buddy told me about it. I thought it would be a good way to give something back," said Lance Cpl. Rodney Roll, field radio operator, 2nd Battalion, 6th Marine Regiment, currently attached to 4th Marine Regiment. "I enjoyed having fun with the little kids. It reminded me of being back home for the holidays."